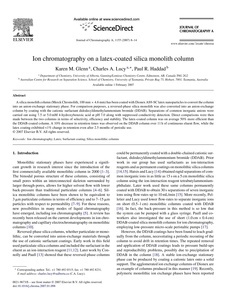 A silica monolith column (Merck Chromolith, 100 mm × 4.6 mm) has been coated with Dionex AS9-SC latex nanoparticles to convert the column into an anion-exchange stationary phase. For comparison purposes, a reversed-phase silica monolith was also converted into an anion-exchange column by coating with the cationic surfactant didodecyldimethylammonium bromide (DDAB). Separations of common inorganic anions were carried out using 7.5 or 5.0 mM 4-hydroxybenzoic acid at pH 7.0 along with suppressed conductivity detection. Direct comparisons were then made between the two columns in terms of selectivity, efficiency and stability. The latex-coated column was on average 50% more efficient than the DDAB-coated column. A 10% decrease in retention times was observed on the DDAB column over 11 h of continuous eluent flow, while the latex coating exhibited <1% change in retention even after 2.5 months of periodic use.